print Print What does my rabbit's behaviour mean? A rabbit's body language can be subtle, therefore it's not always easy to understand how a rabbit's feeling. A good place to start is with a rabbit's ears. If they are close together, facing upwards and pointing outwards, the rabbit is likely to be relaxed and happy. Alternatively, a worried rabbit's ears will be flattened against their back. Other indicators are a rabbit's eyes and their body posture. Additionally, their behaviour can indicate how they are feeling, for example, a rabbit may be anxious if they are hiding. Rabbits body language can be subtle, meaning that it's not always obvious how they're feeling. Use this guide to help you recognise important body language signals. If you're concerned about your rabbit's behaviour speak to your vet first who may then refer you to an animal behaviourist. 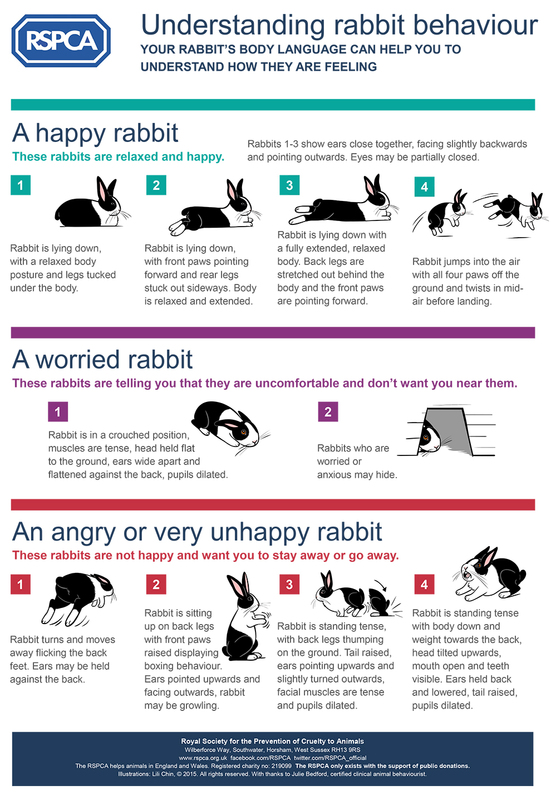 View the rabbit behaviour infographic. These rabbits are relaxed and happy. Rabbits 1-3 show ears close together, facing slightly backwards and pointing outwards. Eyes may be partially closed. Rabbit is lying down, with a relaxed body posture and legs tucked under the body. Rabbit is lying down, with front paws pointing forward and rear legs stuck out sideways. Body is relaxed and extended. Rabbit is lying down with a fully extended, relaxed body. Back legs are stretched out behind the body and the front paws are pointing forward. Rabbit jumps into the air with all four paws off the ground and twists in mid-air before landing. These rabbits are telling you that they are uncomfortable and don't want you near them. Rabbit is in a crouched position, muscles are tense, head held flat to the ground, ears wide apart and flattened against the back, pupils dilated. Rabbits who are worried or anxious may hide. These rabbits are not happy and want you to stay away or go away. Rabbit turns and moves away flicking the back feet. Ears may be held against the back. Rabbit is sitting up on back legs with front paws raised displaying boxing behaviour. Ears pointed upwards and facing outwards, rabbit may be growling. Rabbit is standing tense, with back legs thumping on the ground. Tail raised, ears pointing upwards and slightly turned outwards, facial muscles are tense and pupils dilated. Rabbit is standing tense with body down and weight towards the back, head tilted upwards, mouth open and teeth visible. Ears held back and lowered, tail raised, pupils dilated. Embed RSPCA Understanding Rabbit Behaviour on your site!